The bar was set very high, very early on in 2013 for anyone hoping to have the Southwest’s “Submission Of The Year” award and it turned out the year’s first jaw-dropping submission would continue its dominance over the rest for about 10-months en route to becoming our award winner. 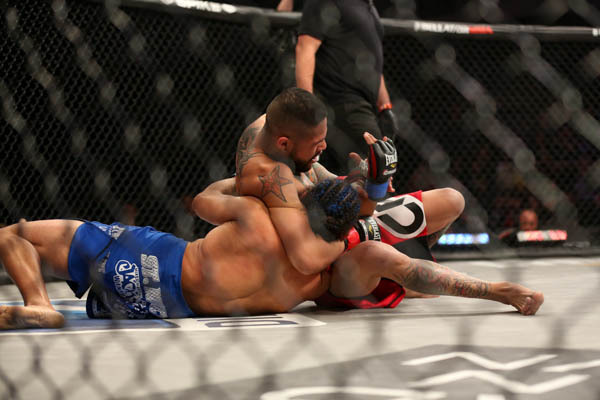 The submission took place way back in February inside the Santa Ana Star Center for Bellator 91 which was Bellator MMA’s first event in New Mexico. The submission occurred in a match-up that was highly anticipated amongst local fight fans and the end result ended basically opposite of what many expected as the man earning the submission was not the fighter that fans thought had the submission advantage. On February 28th, Judgement MMA’s Adrian Cruz (5-1) used a Scarf Hold Armlock to get the tap-out win over Jackson-Winkeljohn product Nick Gonzales (3-1) and in doing so, is undoubtedly this year’s winner of “Submission Of The Year”. Showcased in this picture, the Scarf Hold position from Cruz that allowed the arm-lock submission over Gonzales (blue trunks). This position is good to control your opponent but does not have many submissions readily available. There are lots of escapes from the scarf hold so don’t stay there for too long. The actual submission was the armlock in which the position enabled Cruz to have the correct angles and limbs to perform the finishing maneuver. With Cruz’s legs at the right angle to trap an isolated arm of Gonzales, he was able to tuck the arm between his legs and use his hips to thrust forward which put lots of tension and torque on the elbow joint and turns into basically, a modified kimura sending the pain into the shoulder joint which concluded in the forcing of the tap-out. When executing the armlock, Cruz (arguably) definitely followed the warning of not staying too long but went against that wisdom in that he found the submission quickly enough to take advantage. Cruz works his grappling game with Judgement MMA Grappling Coach Rich Chavez and despite the gym being most known for their striking skills, used his very strong top-game to find opportunity in a very uncommon position. In fact, SWFight caught up with Cruz to talk about the highlight submission. A moment after the above picture was taken, Cruz (red shorts) locked Gonzales’ arm between the legs which finished the submission quickly. When asked about the position, being that it is such a rare submission to hit in MMA, Cruz offered his sentiment on it, “Exactly (that head control comes first). I get to side (control) and try to go for a wrestling style head and arm. When they try to defend, they try to get their arm away from the head making it easy for me to push the arm down and hit the sub.” When asked if the submission is so effective because of its rarity, Cruz agreed in his response, “Well, they defend the head and arm and are not used to that sub so it’s easy to hit and once it’s in your done. Honestly, I can hit that on almost anyone that I haven’t rolled with before. It’s a position that I can hit easily. “Phillip’s Award Commentary: Before this fight, I always saw Cruz as a bruiser and I think personally for me, that’s what makes this submission standout so much more. Yes, Cruz has finished with submissions before but I always considered him a powerful top-game grappler who’d punish an opponent with punches before hunting out an armlock of any sort. That kind of bruiser beats you up until you give up your back for the rear-naked. Regardless, Cruz stole the show with that finish on an event that featured a Holly Holm knockout, a Will Brooks upset and a classic fight between Andres Quintana and Russell Wilson. What goes overlooked is the beautiful throw Cruz hit off the cage; a lateral drop that landed Cruz right into side control enabling the finish to even be possible. Gonzales doesn’t have a bad ground game, in-fact his grappling has always been well-polished and for Cruz to be able to hit something this rare makes it an easy pick to win this year’s award. The wrestling plus Jiu Jitsu chops of Cruz make him dangerous in the clinch and his technical striking makes him even more lethal as he can beat you on the feet as well. Cruz’s well-roundedness propelled him to victory at Bellator 91 and as a fight fan, I can’t wait to see Cruz back in action in 2014.